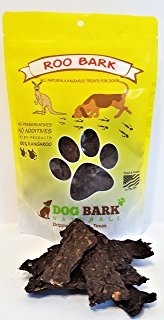 Roo Bark | All Things Woof Meow, Too Inc.
Kangaroo is extremely high in protein and low in fat. A very lean meat. Our kangaroo is free range and wild caught in Australia. It is also a great hypoallergenic alternative for dogs with allergies to other protein sources. Dog Bark Naturals are treats, rewards, incentives, and great sources of protein your dog will absolutely love and ones you can feel good about giving to that beloved member of your family. All of our treats are made with one single ingredient! There’s no guess work in what or how much of anything you get with our treats. Minimally processed and as natural as it gets, your dog will know the difference and love you for it.